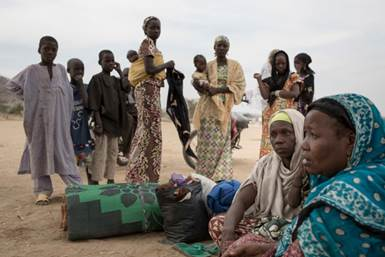 (TriceEdneyWire.com/GIN) – An estimated 30,000 refugees have been uprooted by officials in Cameroon and Nigeria this month and sent to known hotbeds of insurgents including Boko Haram on the Nigerian side of the border. “Reports from sources on the ground indicate that these people are in dire need of aid,” a UN briefing note stated. There were also questions about whether the returns complied with international law on refugees, which require returns to be voluntary, the Agence France Press reported. International and national humanitarian organizations abandoned Rann in January due to ongoing insecurity. Shashwat Saraf, the country director of Action Against Hunger in Nigeria, said it was “difficult to imagine” it being safe for anyone to return. “Alarming” levels of severe acute malnutrition were found among children under five, he said. The mass movement of internally displaced people comes as President Muhammadu Buhari takes office for a second term, having been declared the winner of a national election marred by mechanical errors with the voter card readers, a weeklong postponement, reports of vote-buying, and extremist attacks in the northeast. Voter turnout was at a historic low at 35.6 percent of the population. Buhari won in 19 states – including the two most populous, Lagos and Kano – while the opposition candidate, Atiku Abubakar, was victorious in 17. The two men are both northern Muslims in their 70s who have long been in politics. Buhari is seen by many as a strict, inflexible but personally incorruptible figure, while many hoped Atiku, a wealthy businessman and former vice-president, would enact policies to help boost Nigeria’s struggling economy. The opposition has rejected the vote outcome.